We are pleased to share that Dr. Ed Meadows was presented the highly coveted Leadership in Education Award during the Greater Pensacola Chamber’s 57th annual PACE Awards celebration Wednesday evening. 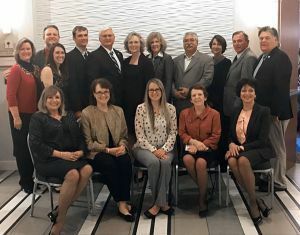 According to the chamber, the Leader in Education Award is presented to an individual with a stellar record of educational service through outstanding contributions to the advancement, mentorship and encouragement of students in or outside of the classroom. Each year, the PACE Awards honor outstanding individuals in the community who have made significant contributions to Greater Pensacola area. “Northwest Florida is home to some of the most dedicated, talented and selfless community leaders, and we want to ensure that we are recognizing the individuals who continue to make our region a better place,” said Clay Ingram, the Greater Pensacola Chamber President & CEO. Dr. Ed Meadows, President, Pensacola State College, Leader in Education Award. Quint & Rishy Studer, Philanthropists and Entrepreneurs, Spirit of Pensacola. Andrea Krieger, President and CEO of United Way of Escambia County, Professional Leader of the Year. JT Young, Customer Service General Manager for Gulf Power Co., Community Leader of the Year. Bruce Vredenburg, President of Hancock Bank, Business Leader of the Year. Vernon Stewart, PIO for the City of Pensacola, Emerging Business Leader of the Year. Meghan McCarthy, Director of Health and Wellness for Baptist Hospital, Emerging Advocate Leader of the Year. Please join the Greater Pensacola Chamber, our Board of Trustees, and the community, in recognizing Dr. Meadows as a true visionary and leader in Pensacola and the surrounding communities! Click here to view the video presentations from the 2017 PACE Awards: http://weartv.com/news/local/eight-outstanding-pensacolians-honored-at-2017-pace-awards.